On Friday, the Soccer World Cup in South Africa will begin. I am not a big soccer fan, but when it's World Cup I do enjoy it and get into it for those 4 weeks. As the Germans are always one of the favorites, I feel obliged to stand up for my country. We will have friends over to watch the opening game. My husband generously let me set the menu for the late lunch/buffet meal that we will have before and during the game. Temperatures in Dubai have reached 35-40C with high humidity, so it would be quite cruel for the BBQ master to get the grill going outside. I think I will do some salads, breads, dips and cold seafood dishes. The advantage of these is that they can be made in advance. And guests always bring dessert, don't they? 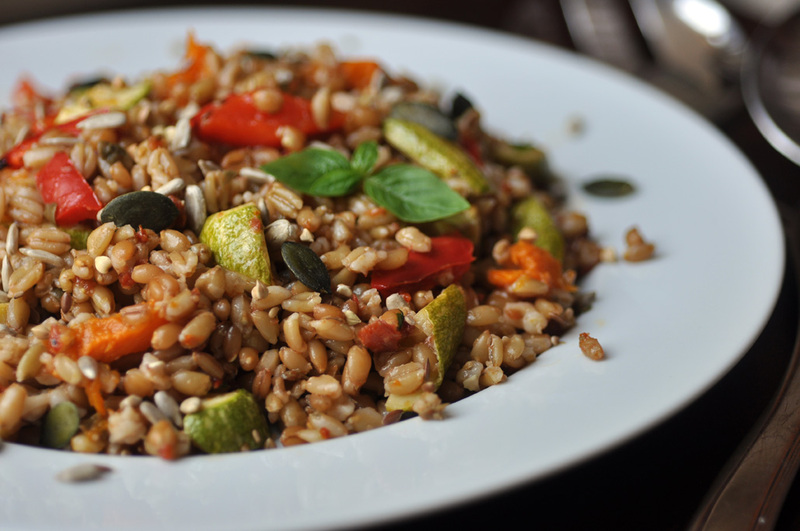 Cook the wheat berries in slightly salted water until tender and chewy, about 45 minutes to one hour. Drain and rinse with warm water. Set aside. Peel the butternut squash. Chop squash, pepper and zucchini into bite size chunks. Transfer to baking sheet. Drizzle olive oil over the veggies and stir until they are coated. Season with salt. Oven-roast for 15-20 minutes. For the red pesto, combine all ingredients in a food processor. Mix until smooth. Stir the red pesto into the wheat berries. Make sure you don't use too much, as the flavor is very strong and can be overpowering. Stir in the roasted veggies and sprinkle the seeds on top. Serve warm or at room temperature.